It's been a really busy week, not just work wise, but also socially there are loads of things going on lately.. Parties, events, launches, and loads of gatherings which have gotten me out of my kitchen, and back into the social scene after having a baby. I spent the day at a friend's BBQ on the Palm, and she had asked me to bring my famous layered dip.. It's always a hit when I make it for gatherings because it's absolutely delicious and fun! But I must share where I have this fabulous recipe idea from, and that would be my soul mate, flat mate, and partner in life Alex! We used lived together in New York for almost seven years, and every time we had one of our crazy parties or big dinners, I would do the cooking and Alex would prepare this phenomenal dip for starters.. This makes a HUGE portion, so please adjust according to the people you're expecting. First make a quick guacamole for this recipe. You could just use store bought, But I just make my own as it's so simple to make. Mash the avocados with lemon juice, add the finely chopped shallots, garlic, tomatoes, a little parsley and chili or jalapeno. In another bowl, mix the taco seasoning with the refried beans and set aside. Now in a large bowl, or Pyrex, layer the dip by starting with half the refried beans, then the guacamole, the cheese, the salsa, the sour cream, the cheese again, guacamole, refried beans, sour cream, salsa and parsley on top. It's not really in any order, so by all means, assemble as your taste buds see fit. I love this! I just did something very similar and did not think it was worth it for a dip...would have rather just had a nice bowl of guacamole. 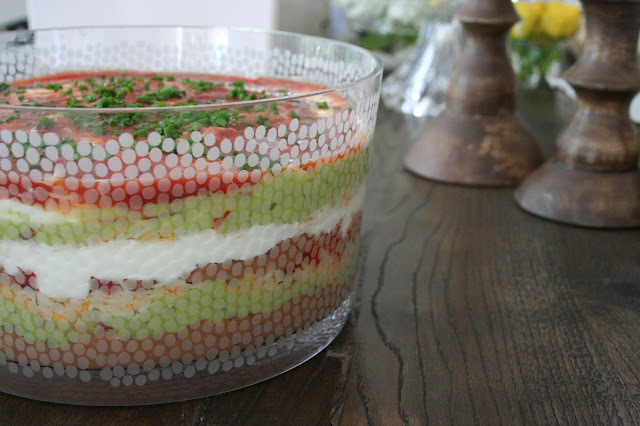 I have never had a seven layer dip that tastes as good as I remember it tasting when I was a teenager.